Mallala War Memorial commemorates ten men from the district who lost their lives in World War One. The monument consists of a globe with the map of Australia as its base, and around the top has plaques listing the names of those who lost their lives. Ten gallant men from the Mallala district gave their lives during the war. 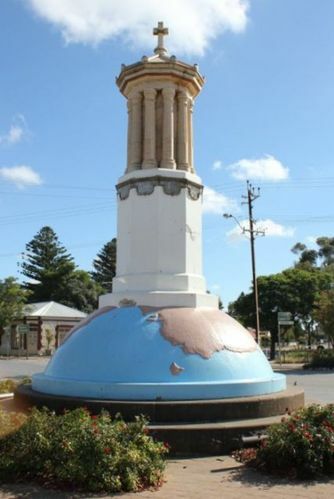 To their memory a monument has been erected at the junction of roads in the centre of Mallala. The bottom of the edifice is dome shaped, 42 feet in circumference, on which has been reproduced the map of Australia. This sphere rests on a circular step, below which are two wider steps, of Victorian bluestone. The lowermost step is 60 feet in circumference. The superstructure is 10 sided; and consists of a die with plinth, standing on a step above the sphere, all of which, including sphere and step below, is of Sydney freestone. The head of the die is encircled by a band of aluminium, with a panel on each of the 10 sides, each panel giving the name and details of a deceased below. Above the die is a structure of Angaston marble, consisting of a pink marble body, with 10 ornamental columns, each having 10 flutes, with entablature and sloping roof above, having a four-sided cross at the head, with 10 anethemions at the eaves. All except the pink body is in white marble. The design and supervision were placed in the hands of Frank H. Counsell, F.S.A.I.A., who arranged a contract with Mr. W. Laycock, while Messrs. Brown Brothers made and fixed the aluminium nameplates. These contracts amounted to about £1,325. In addition to this amount the estimated work of the committee— given voluntarily — was about £350. On Sunday last the monument was unveiled by Lieut-Col. Butler, D.S.O. The Register (Adelaide), 17 October 1922.